Nat King Cole was undoubtedly one of the most popular, successful and respected vocalists of the post-war era, and would have enjoyed even greater success had his career not been cut short by cancer when he was just 45 years old. His success reflected his ability to transcend the boundaries between jazz and easy listening pop, with a unique talent both as a singer and top flight jazz pianist. He initially enjoyed success in the R&B charts with his trio in the early ‘40s, pioneering the piano, bass and guitar line-up, before embarking on a solo career in 1947, and racking up a remarkable string of hits through until his death in 1965. 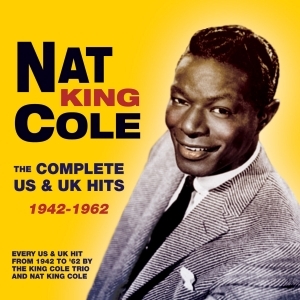 This collection brings together in a great-value 115-track 5-CD set all of his US Billboard chart entries and his UK hits, both with the King Cole Trio and as a solo artist, up until 1962, and includes classic No. 1s like “Nature Boy”, “Mona Lisa” and “Too Young”, as well as many other iconic recordings, notably the perennial favourite “When I Fall In Love”.